Composting with Black Soldier Fly Larvae! Forget the “ick” factor, these strange looking, slow moving “critters” in your compost bin or compost pile may be doing more work than you realize and they are harmless! 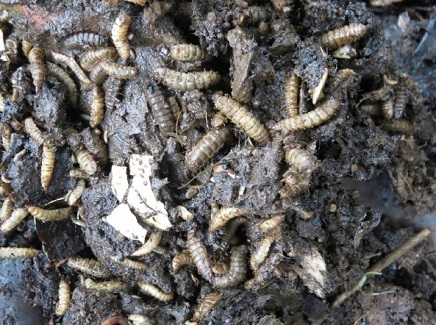 “Black Soldier Fly” larvae eat huge amounts of raw material – including veggies, fat, meat, slaughterhouse remnants – and convert it into compost. They are voracious and can eat as much as twice their own weight per day! In no stage of their lives do they bite (humans or animals) and they are used to convert waste of all sorts into usable compost all over the world. In addition to composting all manner of “organic” materials into compost, they are a very high source of protein – birds love them! They even out-compete regular house flies in the “stuff” they eat, so if you have farm animals and their “poo” this can actually reduce regular flies in your barnyard. Is my compost bin for the “Red worm” or “Soldier Flies”? If you have discovered these strange looking larvae in your red worm compost bin, you have a choice of whether to allow them to contiue doing your compost work, or trying to convert your bin back to a “red worm” bin only. Otherwise, just let ’em “do their thing” and you’ll still get the benefits of their rapid composting activity.